Description Sitting tall with her heavy legs extended before her, this female statuette cradles her round, protruding breasts in her arms. Horizontal bands of pale brown pigment run across her body, emphasizing the full, curved forms of her limbs. The pigment suggests facial features, most predominantly her wide, oval eyes and small irises, on her thin, cylindrical head. She is adorned with a necklace and loincloth, both indicated with painted line. As early as the 7th millennium BCE, cultures in the Near East began to create organized settlements with well-developed religious and funerary practices. The Halaf culture of Anatolia (southern Turkey) and northern Mesopotamia is named for Tell Halaf in modern day Syria and is one example of such sophisticated early cultures. 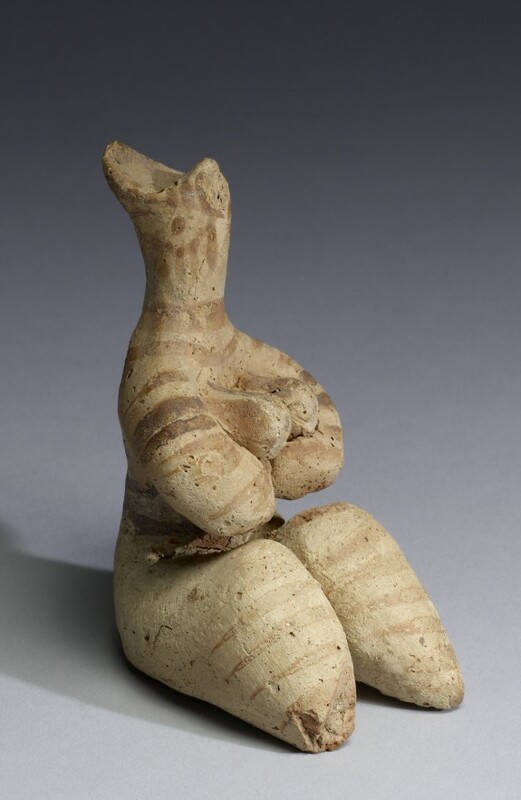 The Halaf culture flourished during the 6th millennium BCE and was notable for its ceramic productions, both its intricately painted pottery and remarkable female figurines. Provenance Dr. André Lagneau, Switzerland, [date and mode of acquisition unknown]; Antiquarium Ltd. New York, 1996, no. ANT 1375 [mode of acquisition unknown]; Walters Art Museum, 1997, by purchase.